All that you THINK you know about our southern border and what REALLY goes on there. The video below, produced in 2013, vividly reveals difficulties in patrolling and controlling this unique patch of North America. Lest recent history be lost to us, let’s keep in mind one simple fact of history: the 911 terrorists entered our country through U.S. airports, not through either Mexico or Canada. This is not to say people who wish us great harm cannot and do not enter through neighboring countries – they do. All the people who have done us harm have walked right in bearing legitimate visas and valid passports. Video: Mexico is California’s number one international trading partner. Lesson Four: Border Fence – How Well Does It Work? The one thing on which I ever agreed with Janet Napolitano was her statement about the effectiveness of a fence. She said, “You show me a 50-foot wall and I’ll show you a 51-foot ladder at the border. That’s the way the border works.” Let’s see if she was correct. Lesson Five: From Where Do Illegal Immigrants Come and Why? 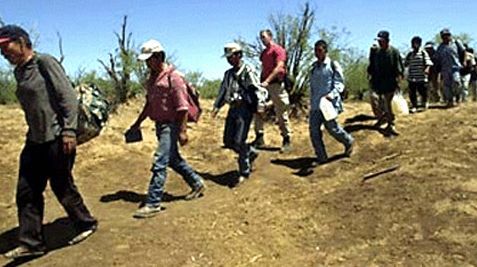 Few illegal immigrants are Mexican. Almost all hale from Central American countries, fleeing violence, extreme poverty and horrific crime. Is this what they think about the country that will give them food, shelter and an opportunity to better their lives? There are crude jerks in all populations. However, thankfulness, it seems, is in short supply.